I was in the mood for something I hadn’t heard of before. Not new, just new to me. B was also thinking some thing with Dubonnet Rouge. 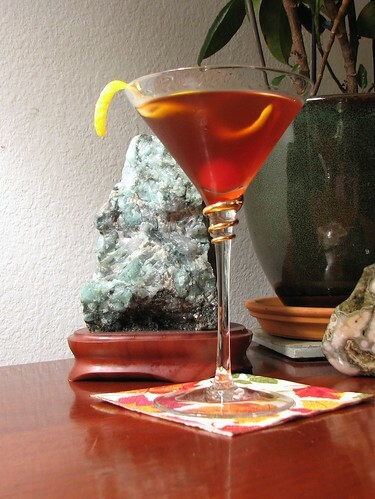 According to the good Doctor’s Vintage Cocktails and Forgotten Spirits (now in a new edition that lays flat on the counter), versions of this cocktial have been around since the nineteenth century with his version being a later edition. The Blackthorn is named after the plum-bearing shrub that produces the sloe berry (from which we get sloe gin). This version, interestingly, has no sloe gin. Haigh claims that the the cocktail has a “plummy flavor” if your taste buds are imaginative–personally, I thought it might take more one to get to that level of imagination, but I take his point.